It's raining cats and dogs outside. And in your house. Yup, the roof is leaking. So other than opening an umbrella in your living room, what do you do now? First, attend to the matter at hand. Move any furniture out of the way, cover what you can't move with garbage bags or plastic tarps. Next? Place a bucket beneath the leak - and to ensure that you don't lose your mind from the persistent "drip" sound, pin a piece of string to the spot on celling and let the water run down it and into the bucket. If water is gathering in a "bubble" on the ceiling, use a drill open up that spot up and release the water. Better that than letting it pool and risking a ceiling collapse soon after. Oh, and naturally, make sure there's a bucket underneath when you do it. Aside from the obvious drip, there are some other signs that you have a roof leak. Water stains on the ceiling, peeling wallpaper, bulging paint, wet spots on the wall and a moldy smell hint at a problem. Finding the source of the leak in your roof often requires some detective work. Where it leaks from doesn't mean that's where it's coming in. Water has its own logic, traveling down beams and trusses to a "weak spot" in the interior. If you have attic access, that should be your first stop. During a dry, sunny day, grab a flashlight and have a look around to see if you can spot any obvious holes or gaps. Be careful: make sure you step only on support beams - not on the insulation or the ceiling itself. Then, begin looking above where the leak is dripping, and keep working your way up to check for wetness. If you're really stuck as to where it's coming in, have a helper use the garden hose to spray a little water (you don't want a bigger mess) over where you think the leak might be. The water will reflect off the flashlight and give you a better sense of where the leak actually is. 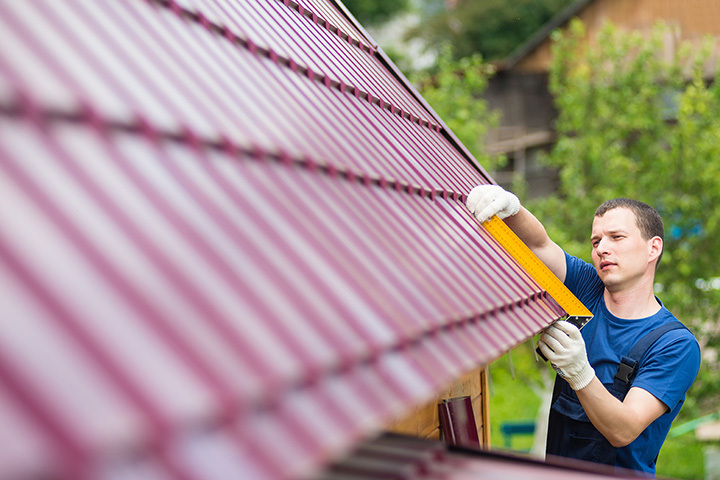 Roofs should be checked out regularly for missing shingles, nails that have worked loose, flashing that needs repair or clogged gutters and downspouts that can back up. Some of this can be done using a pair of binoculars to give the roof a good once-over.